High quality twin satellite cable, dual RG6 coax. Double screened, braid and foil screen. Ideal for LNB dish connections on Sky, Sky Digital, Sky+, Sky HD, Freesat and other satellite receivers and cable TV systems. 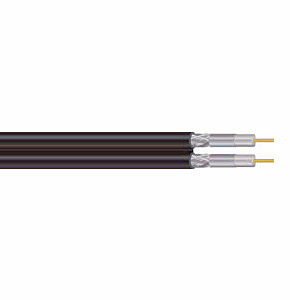 Profigold PGV8000 Oxypure 2m TV Aerial Cable. 24 Karat gold plated contacts - preventing corrosion and maintaining pristine signal quality over the life of the cable. Superior solder free, cold welded connection - Provides superior picture quality over standard soldered connections. Metal connectors to maximise shielding. 99.9997% Pure OCC copper conductor - OCC copper is a new generation, single crystal copper for high speed signal transmissions with extremely low loss. 2 way screening - Provides maximum protection from picture distorting interference. Cellular PE insulation - Provides low signal attenuation for enhanced detail. IAT ( Interference Absorption Technology ) - Reduces Electro Magnetic Interference resulting in unmatched picture quality. Durable, flexible nylon braided jacket - Provides excellent protection. Length 2 metre. A high quality 1.5m f-type to coax plug cable. Length 1.5m. High quality coaxial cable 3C2V/RG59 75 ohm. Jacket white PVC. F-type connector to coax male connector.